Suzanne Shew is often a fixture at Flint & Genesee Chamber events. Chances are you even saw her at the December Chamber Luncheon sporting the ugliest sweater in the ballroom, which, by the way, earned her first place in the annual Christmas competition that celebrates good cheer, holiday spirit and bad taste. 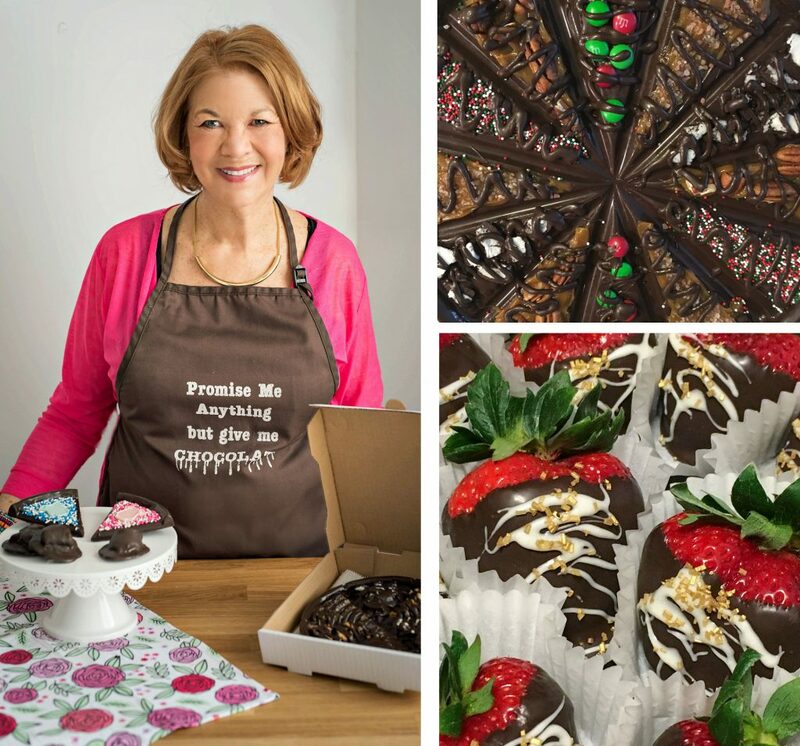 However, aside from her warmth and quick smile, Shew is perhaps best known as Flint & Genesee’s favorite chocolatier and for delivering great taste throughout the region under the name Sweets By Suzanne Marie. Sweets By Suzanne Marie also created a version specially for peanut butter lovers, called “the Murtle.” It combines pretzel, peanut butter and dark chocolate, topped with and Himalayan pink salt. “I started playing with other recipes. Last year, I came up with the chocolate pizza. I had heard of them and had never seen one in this area. They are very popular. I have made probably 100 of them this (past) holiday season,” she said. Other sweets include Kahlua® cake truffles, chocolate s’mores, chocolate covered strawberries, chocolate coated kettle corn, and cinnamon-sugar roasted almonds – her newest creation that’s “going over very well,” she said. Although Shew has been making chocolate for 30 years, primarily as a hobby for friends, family and co-workers, Sweets By Suzanne Marie was borne of necessity. “I’d been in real estate for 20 years and then I left that and took another job. And then, I got laid off. I didn’t have a job,” said Shew. “I was a mature adult. Not a lot of people were looking for mature adults to hire. I didn’t have a degree. The employment I was looking at didn’t pay enough to support me, so I had to come up with an alternative,” she said. 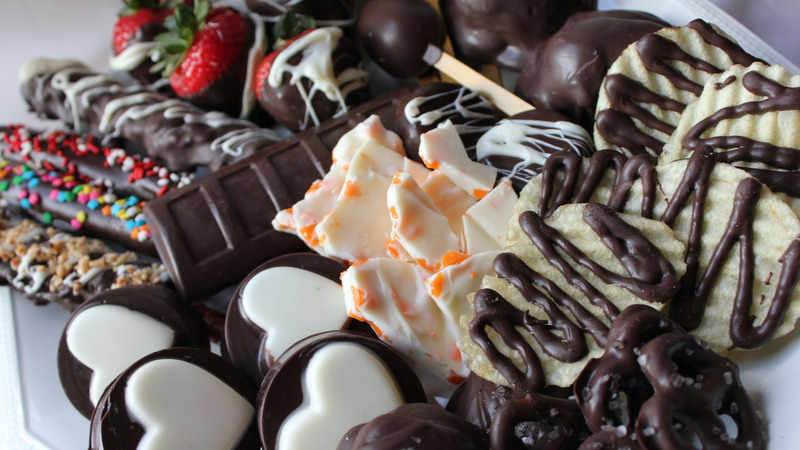 “I loved making chocolates and I knew people loved them. The home-based confectionery serves a growing number of clients locally, including Dort Federal Credit Union, the Flint Firebirds, real estate agents and producers of special events (wedding, retirements and showers). Although largely a single-person operation, Sweets By Suzanne Marie employed four part-time people to help service the holiday traffic. In addition, she has used part-time staff to meet the turnaround time for other large jobs. Shew, whose basement is full of supplies, also sees 2019 as a transitional year.